It's no wonder this card has been the talk of the internet between the reinvented design and the "graphics reinvented" campaign the RTX 2080 Founders Edition doesn't disappoint. The RTX 2080 Founders Edition design is perfect for any build you may have in mind. Between the 8-phase power supply, the 13 blade fans, and the new vapor chamber you'll have that quiet and cool performance everyone wants. With up to 6x the performance of previous-generations the RTX 2080 Founders Edition is powered with Turing GPU architecture and the new RTX platform. 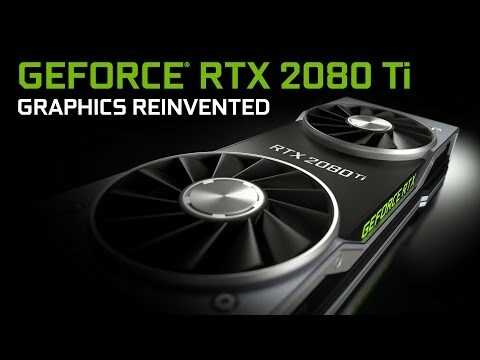 ProClockers would like to thank Nvidia for sending the GEFORCE RTX 2080 Founders Edition over to check out! Turing represents the biggest architectural leap forward in over a decade, providing a new core GPU architecture that enables major advances in efficiency and performance for PC gaming, professional graphics applications, and deep learning inferencing. Using new hardware-based accelerators and a Hybrid Rendering approach, Turing fuses rasterization, real-time ray tracing, AI, and simulation to enable incredible realism in PC games, amazing new effects powered by neural networks, cinematic-quality interactive experiences, and fluid interactivity when creating or navigating complex 3D models. Turing reinvents graphics with an entirely new architecture that includes enhanced Tensor Cores, new RT Cores, and many new advanced shading features. Turing combines programmable shading, real-time ray tracing, and AI algorithms to deliver incredibly realistic and physically accurate graphics for games and professional applications.